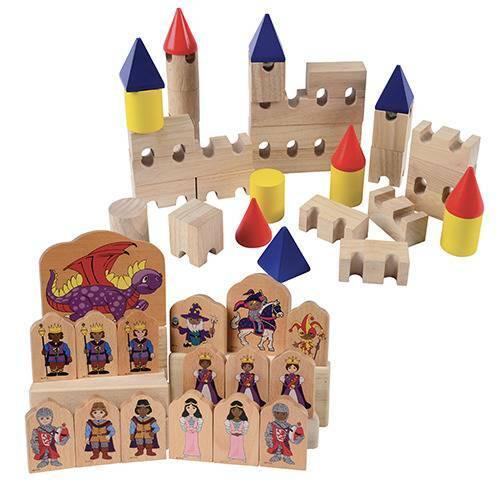 Full-sized ramparts measure 5 1/2" W. x 1 3/8" H. x 1 1/8" D.
Smallest characters are 2 3/4" H. x 1 3/4" W.
34 solid hardwood pieces that add a new dimension to traditional block play by encouraging the imaginations of children. The smooth finish will encourage castle project play throughout the classroom. The 16 royal characters are solid beech wood and are sanded and finished for a smooth feel. The vibrant colors used on the characters are heat-transfer printed and the pieces depict the fronts and back of the characters.